Venerable Ajahn Sumedho is a bhikkhu of the Therevada school of Buddhism, a tradition that prevails in Sri Lanka and South East Asia. Its clear and practical teachings have been well received in the West as a source of understanding and peace that stands up to the rigorous tests of our current age. 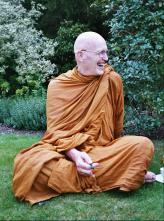 Ajahn Sumedho is a Westerner who was born in Seattle, Washington, USA in 1934. He completed an MA at the University of California at Berkeley, was a medic in the US Navy and taught in the Peace Corps. He left the States in 1964 and took bhikkhu ordination in Nong Khai, North East Thailand in 1967. Soon after this he joined Venerable Ajahn Chah, a Thai meditation master who lived in a forest monastery known as Wat Nong Pah Pong in Ubon Province. Ajahn Chah's monasteries were renowned for their austerity and emphasis on a simple, direct approach to Dhamma practice. Ajahn Sumedho stayed for ten years in this environment during which time he was eventually appointed as the first Western abbot of a Thai monastery. In the late 70s, he was invited to take up residence in the U K by the English Sangha Trust. Their aim was to establish the proper condition for the training of bhikkhus in the West. Their London base, the Hampstead Buddhist Vihar, provided a reasonable starting point. In 1979 the Trust acquired a ruined house in West Sussex which is now Chithurst Buddhist Monastery or Cittaviveka. With the foundation of a proper monastery, the Sangha began to grow steadily in numbers and also took on training for women as Buddhist nuns. The increase in the numbers of people wishing to live the monastic life, or to help support it, made it possible to set up branch monasteries in Britain and also overseas. It also helped to bring about the establishment of a large-scale teaching centre, Amaravati Buddhist Monastery in 1984. Amaravati is just outside the village of Great Gaddesden near Hemel Hempstead in Hertfordhsire. It is both a monastery and retreat centre and welcomes those who are interested in the teachings of the Buddha. 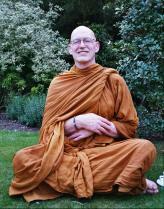 Venerable Ajahn Sumedho resides there as the Abbot and leading teacher. He is also the spiritual director of several other monasteries in Britain, and others around the world. Ajahn Sumedho's reputation as a meditation master and teacher of the Dhamma is renowned and respected throughout the West. Teachings or retreats led by him are always fully booked. He has written many wonderful books on the Buddha's teaching. His style is always clear, direct and easily accessible. I wish to express my respect and support of the Peace Mala Project. My life in Great Britain as a Buddhist monk has been the experience of acceptance and tolerance. The openness and receptivity towards other religions is most commendable. Peace is the very essence of religion and thus the common factor that unites us all. May the Peace Mala remind us of this and contribute to the welfare, happiness and social harmony of all the citizens and residents of the United Kingdom.